This is a personal statement, which simply reflects my own spiritual journey and it may or may not be applicable to you. No criticism is implied and no offence is intended if you are walking a different path. Many of you, I am sure, are aware of the words in the letter of Saint Paul to the Corinthians, when he says "For our knowledge is imperfect and our prophecy is imperfect; but when the perfect comes, the imperfect will pass away. When I was a child, I spoke like a child, I thought like a child, I reasoned like a child; when I became a man, I gave up childish ways." Inherent in this statement is the fact that it is perfectly natural and acceptable for a child to think and to act as a child. There is nothing wrong in a child being a child. Indeed one has to be a child before one can become a man. However, when one becomes a man, one has to start behaving like a man and letting go of one's childish ways, no matter how comfortable or accustomed one is with them. It could be argued that Saint Paul is referring to physical change and social behaviour, but I feel that he is talking about spiritual change and spiritual behaviour. In my own case I see Saint Paul's words as a commentary on my own path to spiritual awakening in this life. At first I was a churchgoer, then an agnostic, then a medium, and then a follower of a guru. Now, however, I have reached a state of being when I can look back and see that all those stages were but stepping-stones to that moment in time when I gave up all those, what St. Paul calls, childish ways and became a man. I now believe that I am an actual part of God, that I am actually God in manifestation, as is everything around me, and that any separate identity from that God is an illusion. The perfect understanding has come, and so the imperfect must pass away. Over the years, as I have walked my spiritual path in this life, I have been privileged to meet many wise men and women. I can recall meeting a wonderful lady who was in her eighties, a Theosophist, who moved me on from the ritual and dogma of Christianity, when I was in my thirties. Then in my forties I became a medium and published books of channellings and teachings received from the White Brotherhood, and whilst on a trip to the Carmel Valley in California I met another wise soul, a retired English professor. I was full of enthusiasm for the channelling process and the messages that I had received and I offered him one of my books. He declined very politely saying " No Thank you. There was a time when I would have been interested, but now I have gone beyond all of that. I am reading nothing. I have turned within." I remember that at the time I was rather shocked by his attitude and thought to myself "How is it possible to go beyond channelling? Surely channelling provides the highest source of Truth that is available to Man?" Then in my fifties, after discovering the limitations of channelling, I came into contact with Sri Sathya Sai Baba and was introduced to the concept of the avatar, of the long awaited messiah returning to Earth, and the statement by some of his devotees that he was God on Earth. At first I found this concept very difficult to accept, because it conflicted with all of my spiritual understandings, for here was duality carried to the extreme! However I slowly succumbed to the glamour of this proposition, especially when I was at Sai Baba's ashram and was surrounded by long-standing devotees, who constantly affirmed that he was God on Earth. The concept of a man of miracles, a messiah, who was supposed to have raised people from the dead, and turned water into wine, was very alluring. In retrospect I am amazed that not once did I ask any of those devotees on what personal experience, rather than second hand experience, such as reading books, they made this claim. If one has never seen or experienced God, how can one possibly identify Him? Moreover Sai Baba himself has asked his devotees not to worship his form. Now, in my sixties, I have come to the stage in my life when I feel the need to reject dualism in any form and I have become attracted to the fundamental philosophic principle of Advaita or Non-Dualism, which simply states "Not Two, but One." If there is no two, then everything is an actual part of the One God, of the One Consciousness. So there is no me; there is no you; there is only God! So who am I? I am God! After almost seventy years of living I have come face to face with the question that I have avoided answering up to now, the one that I have been too lazy to answer, hoping that someone else would do it for me, namely, "Who am I and who is this I that is asking the question?" As I look back at some of the spiritual concepts that I have embraced over the years, I smile inwardly, and realise why I have placed them aside. It was because I was thinking as a child. I was firmly fixed in duality. I was seeing myself as separate from God and all of His creations. When Sai Baba said to me in one of my earlier interviews with him, "Remember, you are God, you are God, you are no different from God", I did not really believe him. All my religious and spiritual conditioning had taught me that I was separate from God, that I had fallen from grace and that the purpose of my being was to journey back to God. I believed that in order to achieve this goal I either had to endure thousands of physical lives on the Earth, practising great austerities, or else I had to follow a guru unquestioningly, who would grant me liberation if I led a pure life and balanced out my karmic account. I was, I must admit, very comfortable with this philosophy, because it was much easier to keep on coming back for life after life or to follow a guru who promised liberation than it was to discover the reality of the Godhead for myself. Then, quite recently, whilst reading a book about Non-Dualism, I came across the following statement, which hit me like a lightening bolt; 'any guru is simply sitting on the bank of the river offering a cup of water'. The implication here is that what the guru is offering is just a sample of the river. In order to fully experience the river (the river of God Consciousness) one has to dive in and experience it for oneself. The guru cannot do this for you. Only you can do this, and it comes not from reading books, not from attending spiritual workshops, not from following any guru, but from immersing yourself in that stream of God Consciousness. So why wasn't I prepared to climb up on the bank and to dive into the river? Why was I satisfied to accept the cup of water and not to question whence that water came? It was because the cup of water was more readily available and, more importantly, was less daunting than the task of finding the source. Moreover I realised that just as any water in a cup would lose all of its identity when it was poured back into the river, rather like a raindrop falling back into the ocean, so would I if I gave up my apparent individuality and merged back with the Source of All Life. I discovered that I was attached to my spiritual identity, not just in this life, but also in my past lives. The continuation of my identity as a separate, unique and identifiable soul was important to me. It gave me comfort and security. Yes, I was going to die, I was happy to accept that fact, but at least a part of me would live on after death. But was that part real, or was my soul just another false identity, another false mask? Was there something behind the soul? When I say 'I am a soul', who or what is the 'I am' that is asking this question? Throughout my life I have been aware of what I call the 'I am' presence manifesting in me. At first I regarded it as on over-soul, as a spiritual presence standing behind my soul, but gradually I began to realise that it was not an individual source, but a universal source. It was the Divine Presence. It was totally universal. It was totally unconditional. It was all-seeing and all-knowing. Wherever it guided me was always for my highest good. Whatever it prophesied always came to pass. Amazingly, whenever I wanted it to appear, it rarely did, and whenever it did appear, it was usually unasked for. I soon realised that it sought me; I did not seek it. I could not make it appear. Whenever it did appear, there was absolute certainty in my life. I felt totally at one with the whole of creation. There was no question of whether or not to accept its wisdom and guidance. It just flooded my being and I was at one with it. The 'me' of this life, or of any past life for that matter, did not enter into it. There was no 'me'. It was a very strange feeling, mainly because I was unaccustomed to it, but nevertheless one with which I felt totally at home. Perhaps because I thought that it was for the most part inaccessible, even if it was the highpoint of my spiritual life, I did not dive deeply into the true nature of its being, but turned instead to more accessible inspiration, believing that the cup of water was a fair substitute for the river. I did not dive deeply to find the pearl of great wisdom, but chose instead to stay near the surface with lesser jewels, with which I was more familiar. Looking back on my life I have no regrets for making this decision, because I simply did not appreciate the value of what I was missing. Today, however, on reading about the experiences of the few people who have found that pearl, who have become one with the Source of All Life, who have experienced and indeed live in non-duality, I realise that my whole life has been but a preparation for this final act of surrender. In truth, though, there is no act of surrender. The 'I am' is the totality of everything, so what is there to surrender, and who is doing the surrendering? It is more a case of seeing the reality and the unreality will automatically drop away. So today I seek to always place myself in a frame of mind that sees only non-duality. Of course I am still living in duality. Non-duality is still only a concept for me. I really don't feel that I am God. However, when I catch myself acting out of duality, when I find myself seeing division and separation, when I observe myself judging and comparing, when I feel the little 'I' rather than the 'I am' rearing its ugly head, then I try to empty my mind of those thoughts, I try to create an atmosphere within me, a receptive energy field, so to speak, in which the 'I am' presence can appear. To this end I follow a threefold path. Firstly, I try to practise total acceptance of everything that comes into the aura of my being, every waking and sleeping minute of the day. God's energy impels everything. I am simply God meeting God, so who am I to question what God has decided either for me or for anyone else? There is no good or evil, no pleasure or pain, no loss or gain, for everything is God, so everything is perfect. I recognise that what I am seeing simply reflects what I am within. Every day I appear to be faced with choices, but the reality is that I really have no choices to make. To use the analogy of a hero in a film; in the beginning of the film the hero might appear to be agonising over the choices he has to make, which will supposedly determine his future, but if we jump forward to the end of the film, we can see that his future is fixed and that he really has no say in the matter. The director has already decided his future and God is the ultimate Director! Secondly, I try to base my daily life on the principle of unconditional love and, as such, I try to stop judging and comparing, I try to be alike to everyone; I try to see everyone as the presence of God standing before me. I try to help everyone who comes into my path each day in whatever way I can. In any situation of conflict or criticism I simply say, "I am God meeting God. I will only be a channel for God's love." The old saying that love makes the world go round is so true, but we should realise that it is not physical love, but divine love that impels our lives. If we love God, and if we love ourselves because we are God, then we can only exude love and everywhere that we go and every person that we meet will be touched by our love. If you squeeze an orange you will get orange juice, there is no choice in the matter; similarly, if a person filled with love is 'squeezed' by some conflict or outside pressure, then you will get only love from that person, there is no choice in the matter. Conversely, if you 'squeeze' someone who is filled with hatred and bitterness, then you will get only hatred and bitterness out of them. Thirdly, I try to be happy with my situation in life, no matter what is happening to me or around me. Bliss is the inherent nature of realised beings, which are untouched by the so-called troubles of the world, because they are one with the God Presence, Whose very nature is bliss. Spiritual ecstasy, as opposed to physical ecstasy, is the bliss that we seek, because it is permanent and lasting. It is our birthright. 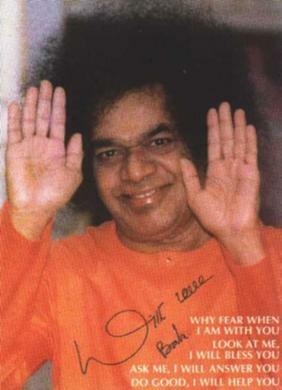 Sai Baba is constantly exhorting his devotees to be happy and is forever saying, "I am always happy." The 'I am' is always happy. If we are unhappy then it is because we have separated ourselves from God or, rather, because we think that we are separate from God. We are not prepared to accept that God is in everything, that God empowers everything. We are saying that the drama of life should be in accordance with our wishes, not God's, and as that will never be, so we are doomed to be unhappy. So I invite you all to go on a journey of self-discovery, of self-enquiry, a journey that will probably begin by you establishing what you are not. Start with the fact that you are not your body and progress onwards from there. Ultimately, I believe that you will come to the simple statement 'I am God-consciousness', which is the basic tenet of Advaita or Non-Duality. I am one, existing without a second. Follow the ancient Socratic injunction of 'Man, know thyself'. Is it not amazing that our modern educational systems encourage us to 'know' or to learn about everything that is around us, but not what is within us? Is it not the case that the pursuit of self-knowledge is often regarded as an indulgence in this materialistic, goal-orientated society in which we live? Most people today would rather watch television than observe themselves. They believe that the external world, as seen on television is real, and that the internal world is unreal. We have been taught to learn by looking out, rather than by looking in, and yet the greatest source of wisdom and truth lies within us. When you meet a realised being, it is apparent that they view life very differently from the average man in the street, in fact sometimes their views are 180 degrees opposed to conventional thinking. For instance, here in the Western World, we usually are very happy when a baby is born, and are very sad when someone dies. We laugh at birth and cry at death. A realised being once said 'I cried when I was born, and I will laugh when I die!' The implication here is that the 'I', not the body, was unhappy about leaving the state of Oneness it inhabited before it incarnated into the world of duality on the Earth, but was very happy about returning to the state of Oneness again after death. Many realised beings talk about life in the physical body as being 'in prison'. It is self-knowledge, the knowledge of the 'I am', that makes 'prison' bearable. The end of ignorance is self-realization; it is the understanding that the 'I' is not a separate identity, separate from all the other 'I's around us and separate from God. Before and behind the 'I' there is God-consciousness. We are created by and inspired by God-Consciousness. Look behind the veil of illusion, the body of name and fame in this life, and know that you are an actual part of God. Constantly affirm that you are God. Know that you are not your body. Challenge yourself every day with the question "Who am I?" and one day you will experience the reality of your being and will know that all is one, and then you will be able to say the ancient Vedic words "I am that I am" and truly know their meaning. Copyright Ramala Centre. "You are welcome to reproduce any of the articles published in the newsletter, provided you acknowledge the source."